Iain Stewart Watercolors: My Plein Air Kit..what you need and what to leave behind. Traveling light. My Plein Air Kit..what you need and what to leave behind. Traveling light. Readying myself for a longish jaunt to Europe to teach / explore / teach / visit family and generally miss as much of the Alabama summer as I can. I will be teaching two groups on this trip and thought that a blog post on what I carry might be of some interest. My big plein air bag with easel et all weighs in at around 15lbs. I have a smaller bag that I use for only sketchbook work that is about half that. Pics to follow. Another thing to keep in mind is weather conditions will change, pack a light weight raincoat, a hat with a visor is a must, and bring along sunscreen, bug spray, what have you, so that you are going to stay as comfortable as can be. I'm pretty good at finding the shady spots with a view, and from trial and error, have learned that the more comfortable you are the longer you will work. The longer you work and the more comfortable you are the better your paintings will be. 1. Pencils... I carry a few in a little soft case with a zipper. I keep my pencils, eraser, sharpener, and two travel brushes in it. I keep the sharpener in a zip lock bag so the graphite wont get everywhere....believe me it will. Tape for stretching paper, eraser, sculptors tool for getting a good tight connection with paper and board, various pencils, and I usually keep a snack in my bag incase I get nippish. The pencils I suggest are HB, No.2, B, and 2B. I also have a stash of old Berol 314's which you can't get anymore. All of this, excepting the tape, and in addition to the sharpener and travel brushes, knife (see later) go in this bag. Everything where I need it. I use that one too and it's fantastic. Lightweight. Inexpensive, made from recycled materials et all. Be sure to carry a zip lock bag to put your palette in when moving from location to location as you don't want mucky water getting in your bag. Brushes- I can do 99% of my paintings with 3 brushes. I use an Escoda Optimo No 14, (a good alternative for that is the Escoda Prado No.14), an Escoda Perla No. 14 round, and an Escoda Perla No. 6 round. I also have a Neef squirrel mop No. 4. Recently I've added the flat brush but it's not necessary. Remember....only bring what you need. 14 brushes are way too many to carry all day. I use a worn out old bamboo roller brush holder. Bring a rubber band to hold it together the strings always break on these guys. I use a Faber Castell collapsing water container and keep a rag in the ziplock bag to soak up extra water. I have a collapsing water carrier. This is a Vapur brand. It works well. Either that or I'll bring a bicycle bottle and use that. Keep your sharpener in a ziplock bag.....keeps the muck out of your bag. If I'm traveling in the States I'll keep the knife on me for sharpening pencils, opening beer bottles, and note the corkscrew. Very handy. Overseas I usually leave this behind as I don't want some overzealous airport employee to purloin it. The travel brushes are by Escoda and I keep them in my "out with only a sketchbook" set up. I use a Stillman &Birn Alpha series sketchbook. 9" x 11" or so. I also keep a smallish 9" x 6" one for when I want to really travel light. As you can see the paper accepts watercolor very well. For going back and working from the day's photos or touching up your paintings I bring along an ipad and transfer my pics to it at night. Other sundries and necessities for the bag. I keep postcards of my work, my biz card, gum, a small camera with extra batteries, lip balm, sunscreen, some cash, and something to snack on. The Tide Marker is fantastic for getting spatters of paint off of your shirt or pants in a pinch. I don't typically carry a DSLR camera as they are heavy. If my wife is with me on a trip we bring the big camera and she carries it. Nice of her no? I keep a 11 x 16 masonite panel in my bag for stretching paper unless I am using an Arches watercolor block. I will pre cut Arches, Saunders Waterford, or any other paper I use and keep them in a bag along with this board so they stay protected. Gator board is also a fine alternative to masonite. Lighter too. I use velcro tape to make sure my board will say on the easel. I don't like bulldog clips as I find they get in the way. Bring a hat with a visor. If you are in a particularly hot part of the world bring a lightweight scarf or hat with better coverage. War Eagle by the way. Keep your paints in a ziplock bag as well. ONLY bring what you need. Fill your pallette the night before so you're not lugging around paint all day. It's heavy. I've flown with these in my carryon bags and have had no problems yet. Still- put it in your checked luggage if you are worried. There's an art store in most cities around the world. I have my "go to" colors listed on my website and primarily use Daniel Smith colors. Packed and ready to go. Everything fits- this is a Timbuk2 messenger bag. My advice on choosing a travel bag for painting is take your easel etc to the place where you are buying the bag and see how it fits. Is the bag comfortable? I know a lot of painters that use carryon bags with wheels. I do a lot of walking around in the rough stuff so they don't tend to work for me. Here's my sketchbook only bag. Very light, very comfortable. I'll either use this or a regular backpack... It just depends on how I feel. If I'm in a big city I tend to use this one. I don't like having my zips exposed in crowds. Any comfy messenger bag will do. This one is a Brooklyn Industries bag and it's sturdy and fairly bomb proof. So there you have it. All my stuff, ready to go. If brass palettes are your thing, I'm currently having Efrain from Iba Co. palettes create a smaller version of my Craig Young. It will be for those days I want to keep things as light as possible, but still paint in my sketchbook. It's tiny. About the size of an Altoids tin. If you haven't checked out his site click the link above. I sent him detailed drawings of the exact palette I wanted and he's crafting it now. Hope to have it next week. If you want a similar palette for about 8 bucks check out this link on how to make a palette out of a real Altoids tin. They work great. My only suggestion is to spray the interior with a porcelain white paint so you can see your colors. Still, it's good to keep in mind, the materials do not make the artist. I use high quality paints and paper and the new Escoda synthetic brushes are fantastic and fairly inexpensive. Use what you have on hand as much as possible. Practice fitting everything in your bag and setting it up. Lastly and this is very important. Keep a couple of mylar bags or something waterproof for keeping your finished paintings in. I typically work at 1/4 sheet size on site and that makes everything much more manageable. 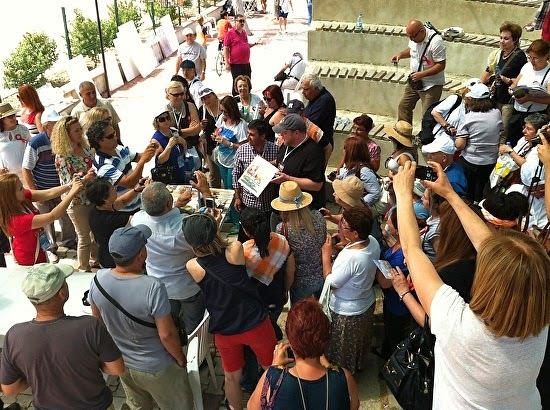 When I was in Turkey last year doing demos for the IWS I just had that little grey bag with me. I was asked if I had everything I needed for my demo and I said sure. They couldn't believe it all fit in that small bag. Less is more- comfort is king- paint like there's no tomorrow. Cheers all. All of the materials I have here can be purchased online. I use Daniel Smith or Blick for most of my materials. If you have an amazon prime account search for your materials there as most art companies have a portal site through amazon. Free two day shipping! Demo in Turkey using materials that all fit in the little grey bag. awesome blog post...very inspiring to get my bags pack and head out. Wishing you the best on your workshops and hopefully some day you will be in my neck of the woods and we can paint. Wonderful post, thank you for sharing all this fabulous information. From one who travels a lot I found this extremely helpful. Safe travels and happy painting. Dear Iain, thank u for sharing the precious information. These tools, your hands and skills create beautiful work that inspire me. Keep up wonderful work! That was so comprehensive,Iain. And though I will not be going out to paint anytime soon, it is really good to know the process and the materials, thanks for sharing! I love your art. I like this post Iain . Is good for us know yours tools . Thanks for share with us . Thank you guys! I'm always interested in what other painters carry. Great info- I used this as my "Bible' of travel painting supplies- I don't know whether to carry on my clothes bag and check my painting bag or the other way around- I would rather they lose my clothes than my painting bag? Just worrying about the alum easel etc. Guess I could put the easel in my checked clothes- See you in Barcelona!